Let’s Meet @ “The Wall”!!! Greetings from YFL!!! Happy Holidays (enjoy whatever you celebrate during this beautiful season of the year)!!!! We at YFL wish you a joyous time with family and friends, and a happy, prosperous New Year in 2018!!! This week Let’s Meet @ “The Wall”!!! We will use the wall as our prop of resistance to improve alignment, tone and strengthen, and to maintain connection and focus to the body via our breath!!! Our Sanskrit focus is very appropriate for the season, AUM Shanti, Shanti, Shanti, or Peace Throughout the Universe!!! Our hand mudra is also one of connection and grounding, or the “Grounding Mudra”. This helps maintain our focus, tasks, and goals, and prevents discombobulation and flightiness!!! I am suggesting a meditation focus of “Peace on Earth”, and selected music for your contemplation from “Bhakti Hreem’s”, “Devotion”. YFL will be CLOSED 12/23-12/26 and 12/30-1/2/18 for the holidays!!! The Winter Solstice Drum Circle will meet on January 7th, from 5-6 p.m. to welcome in the new season!!! Bring a drum, or rhythm instrument of choice, and a friend!!! It is fun and FREE!!! This entry was posted in Uncategorized on December 18, 2017 by Deb Potts. Greetings from YFL!!! 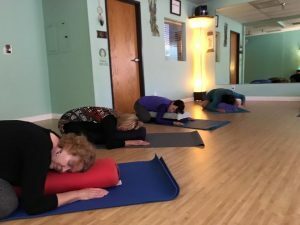 Amidst all the hustle and bustle of holiday festivities and preparations come in to the studio, slow down, breathe, and let’s practice the Triple “R” of yoga—Restore, Relax, and Renew!!! Yes, it is Restorative Week!!! Our Sanskrit focus is MOKSA, which is “to liberate” from and release from suffering and ignorance. It permits spiritual freedom. The supporting hand gesture or Mudra is the GARUDA, or bird mudra. This hand gesture promotes good circulation, and balance of the body energies. Our meditation focus is “Calm is a Super Power”, and may be your focus while listening to the beautiful music of Tom Barabas’s “Nuages” from “Clouds”. A reminder that we do have gift certificates available at YFL, if you need those last minute stocking stuffers, or presents on your list. They are available from Deb at the YFL desk. YFL will BE CLOSED on the following dates for observance of Christmas and New Years 2018: 12/23-12/26 and 12/30-1/2. ATTENTION: The Winter Solstice Drum Circle Event has been moved to January 7th rather than December 17th, and will meet from 5-6 p.m.!!! It is a fun, FREE way to usher in the new season. It is rhythmic and meditative!!! Bring your instrument, and bring a friend!!! It will be another great week at YFL!!! I am proud to announce that City Beat News has selected YFL as the Best Yoga Studio in Temecula for four consecutive years, as determined and presented by Best Businesses. We couldn’t achieve this without your support, comments, and ratings. So, please continue your Facebook likes, Yelp 5 star reviews, etc.!!! We are humbled and grateful!!! Dhanya Vad!!! 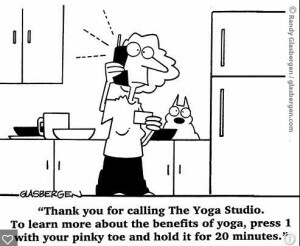 The third annual Artistry of Yoga 200-hour training will begin on Saturday, January 13th!!! We will meet for 20 weeks on Wednesday and Saturday of each week. All the program details are listed on the AOY icon from the website. Registration deadline is drawing near!!! This entry was posted in Uncategorized on December 11, 2017 by Deb Potts. Greetings from YFL!!! This week will continue with an energetic style practice, as we incorporate the hand weights, and emphasize bearing our own body weight as well. It is a strong, rigorous, and invigorating practice!!! The hand gesture, or mudra, is the Ganesha. This evokes energy for overcoming obstacles along life’s pathways. It is suggested that the user visualizes upon the color red, or various tones of red within a mosaic or mandala formation. This will strengthen, warm, and widen your heart, giving you the courage to be open and confident. The Sanskrit focus for the week is “JIVA”, or the “individual self”, or embodied soul. Jiva focus helps to still the fluctuations of the mind, and uplift the citadel of the body, or our soul. This week’s meditation focus will “Stillness”. This is a great focus as we enter the busiest time of the year. Try to weave into your schedule periods of quiet and stillness. The supporting music for meditation will be “Cristiforis’ Dream” by David Lanz. As we enter the holiday season, we encourage you NOT to abandon your mat, and to consider gifting yourself, a friend, or family member with class certificates for yoga and or meditation at YFL. Drum Circle for welcoming the Winter Solstice will be Sunday, 12/17 @ 5-6 p.m. This is a fun and FREE event where we drum in the energy of the new season. Bring a rhythm instrument or borrow one at the studio, bring a friend, and let’s meditate to the vibrational sounds of rhythm. YFL WILL BE CLOSED on 12/23-12/26 and 12/30-1/2/18. The 2018 Artistry of Yoga, 200 hour Teacher Training program, will begin on January 13. We will meet each Saturday and Wednesday for 20 weeks. Noon to 4 p.m. on Saturday, and 5:30-9:30 on Wednesday. The program is led by Deb and Sophie with guest instruction by Leslie. Full details are available through the YFL website, www.yogaforlife06.com. Just click on the AOY icon button for complete information, and how to register. This entry was posted in Uncategorized on December 4, 2017 by Deb Potts.